A battle has been brewing between big gaming companies operating in the Las Vegas locals market and slot parlors for years. The proliferation of Dotty’s and similar business models occurred during the recession when retail vacancies skyrocket, creating favorable rental arrangements in what seemed like a win-win situation for an otherwise devastated commercial real estate market. After dozens of these businesses were approved with the full knowledge of the model as early as 1996, Station Casinos, Golden Gaming, and the Nevada Resorts Association pressured state and local governments to ban these slot parlors. 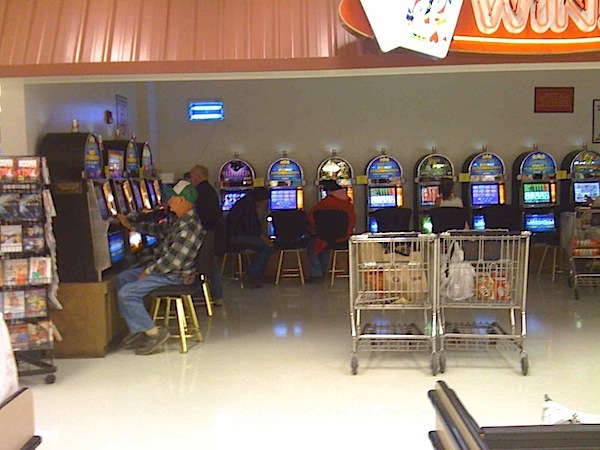 The argument was that gaming is not incidental to these establishments, a requirement for taverns that operate slots. The big gaming companies won earlier this month when the Clark County Commission decided by a 6-1 vote to pass protectionist legislation that forces Dotty’s and similar business models to adhere to new requirements. Commissioner Chris Giunchigliani deserves special recognition for casting the lone dissenting vote and trying to hold the ground that applying this law retroactively is not appropriate. The ordinance applies to any establishment opened after 2006. This was the second time in three years that the Clark County Commission changed the rules in the middle of the game retroactively. The new law requires at least half of the machines in a tavern to be embedded in the bar. A kitchen must also operate at least 16 hours a day. A tavern that receives more than half of its revenue from segments other than gaming is exempt. A majority of taverns that offer gaming derive more than half of revenue from gaming. A tavern that falls under these rules is allowed to operate up to 15 devices under its restricted gaming license. An establishment that does not qualify may only operate seven machines. What Will Next Fight Be? The new law gives an out to slot parlors; open an establishment with just seven machines and there is no need to have a kitchen. Let’s not pretend a seven-machine slot parlor wouldn’t be profitable. Assuming a 3 percent hold, this hypothetical slot parlor would only need a handle of about $350,000 in a month to breakeven. That is about a handle $1,600 per day per machine with a win of about $50 per day. This scenario would also require twice as many retail units. The next thing we know, the argument of needing to limit the proliferation of slot parlors in Las Vegas has achieved the opposite of its intention as it takes twice the number of establishments to spread the same number of machines. Do we revisit the new law again? History shows that there is no issue with changing the rules in the middle of the game for a second time. There is no reason to believe that a third time is out of the question. There are thousands of places to gamble in Las Vegas. The most out-of-place gaming is located by the checkout areas at grocery stores. The new rules that target Dotty’s do not have any effect on gaming within grocery stores, drug stores, or gas stations. In what might be a massive coincidence, Golden Gaming operates the slot routes in many of these locations. One could argue that slot revenue is incidental to retail outlets. On the other hand, these are essentially separate casinos sharing retail space with a store. Many of these businesses, especially gas stations, would not be able to survive if the revenue from gaming was lost. On the other hand, it is hard to describe images like the one in this article as anything other than degenerate and it is a sight seen by Las Vegans on any trip to the grocery. Dotty’s was not harming anyone except big gaming. Even then, the typical customers at Dotty’s may not even frequent taverns or locals casinos if Dotty’s were forced out of business. All this does is remove options from players that decidedly chose Dotty’s over competing businesses. This is the second change in policy since 2011 on establishments that were already approved. If businesses cannot rely on the rules to stay the same once becoming successful, they will be less likely to invest in the community. It is one thing to restrict future development – and I doubt anyone would have argued against such a policy – but forcing business owners to spend millions to comply with the latest unnecessary regulations because its competitors are unhappy at its success is not the answer. This brings up another point. Restricted gaming establishments are not paying tax revenue based on the win collected from machines. Resorts must pay 6.75% of gaming win to the state. While this is not a local issue, we need to look at taxing gaming equal among all market participants. One can hardly claim that a tavern with 15 video poker machines is anything other than a casino that just happens to have bar food and pool tables.